The new issue of Montana Journalism Review (MJR) is fresh off the press, produced by an all student staff from the University of Montana’s School of Journalism. The magazine is dedicated to holding a mirror to the news media in Montana and other western states, reporting and interpreting trends that affect journalists in this part of the country. Issue 45 is built around the theme “burn,” with a cover story analyzing what gets lost in often sensationalized coverage of the wildfires that are so much a part of the western landscape. Other features examine how newspapers cover anything from state politics to the new Cannabis beat. Cutting-edge scientists speak out on overlooked stories; freelancers get tips on how to make their work pay, and radio icon Ira Glass offers career advice. Students on the staff of Montana Journalism Review receive a crash course into the world of producing a high quality magazine. As other classes ramped up in September, some students of the capstone class that produces MJR were already reporting, writing and photographing on deadline. Others chased down outside contributors, who often had far more years of journalism experience than their newfound editors. For the first time, some of the stories were published on Medium.com, an alternative story platform that specializes in long-form work. This year’s MJR team worked on improving the fact-checking and copy-editing system for increased accuracy and a more effective workflow. Corrections are now easy to find on the magazine’s newly designed website. All stories, along with past issues of the magazine, are available online. The print magazine, which is sent to subscribers across the North America and even Europe, can be ordered through the website. Loosely defined, investigative reporting is the arm of journalism that deals with the uncovering of facts and stories that illuminate wrongdoing and injustice. These are the stories that some would wish to remain hidden. It requires hard work, a nose for documents and data and an ability to find good sources and draw out the information they have. It’s reporting that can carry a deep impact and foster change, but also reporting that requires a major commitment from the organizations that carry it out. In an era of decreased resources for media outlets, investigative reporting has often fallen to the way side. “Globalization and development have placed extraordinary pressures on human societies, posing unprecedented threats from polluting industries, transnational crime networks, rogue states, and the actions of powerful figures in business and government. 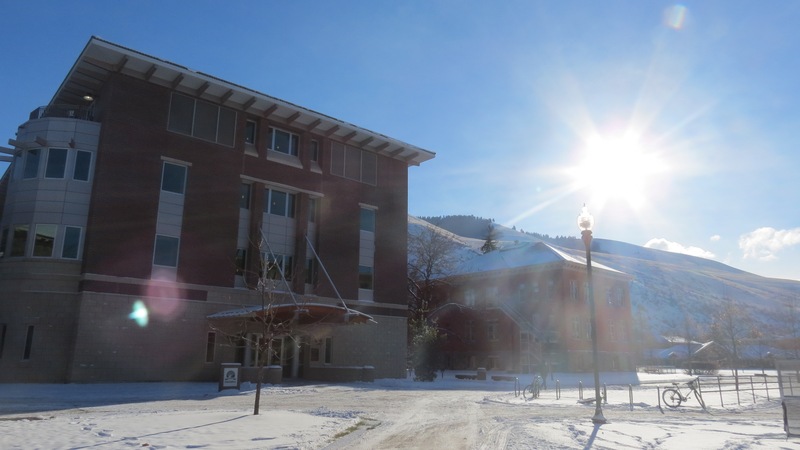 At the University of Montana School of Journalism, an Investigations class is offered once a year. It’s taught by Assistant Professor Joe Eaton, an award winning investigative reporter who worked at the Center for Public Integrity before joining the faculty in 2013. While students in the class don’t necessarily take on transnational crime networks or rogue states, under his guidance they launch investigations into local and regional issues and institutions. At the semester’s end, we caught up with a few students from the fall 2015 class, to hear about stories they’d come up with and lessons on reporting they’d learned along the way. Kasey Bubnash, a junior and a news reporter for the Montana Kaimin, signed up for the investigative reporting class following her semester in Eaton’s Public Affairs class last year. Investigative reporting differs from other journalism classes because students have more time to work on projects, Bubnash said. Students pursue a variety of investigations, some of which take more time than others, and stories from the class come together at different speeds depending on the difficulty of reporting they entail. Some stories, Bubnash notes, just don’t work out. Experienced investigative journalists call these ‘dry holes;’ lots of digging for little results. Bubnash started the semester working on a story about HIV in urban areas. It was a tough task to report from Montana, and she said she ended up unable to get the sources she needed to make it work. In the end, she wrote a spin off story for the Montana Kaimin on a preventive pill for HIV, and moved on to the next project. The story she’s now finishing up is about the lack of clear regulation for home renters in Missoula. Bubnash says the current situation is harmful to both college students and landlords, and that both parties take advantage of it. She was inspired to do the story after Eaton showed the class an investigative report on a similar issue in Boston, MA. Ken Rand, a graduate student in the Environmental Science and Natural Resource Journalism program, started a story that will become a part of his master’s project. In conjunction with an on-campus genetics lab he has been tracing salmon from local grocery stores, to see if their labeling matches what genetics say is their true origin. “It kind of questions the underlying label, everything for the most part is labeled Alaskan seafood or salmon, when in fact the majority of it isn’t from there,” he said. Rand signed up for Investigations in order to shore up what he saw as gaps in his abilities as a journalist. “I could see in the reporting that I did before that I didn’t have the tools to do what I needed to do with data,” he said. Peregrine Frissell, a senior, found himself investigating journalism itself. His first story dug into how Montana newspapers balance online free speech with protecting the advertisers responsible for their revenue. That piece will run in the 2016 Montana Journalism Review, which will be distributed this month. Frissell said the class really grabbed his attention, not only in the reporting he was able to do but also through the classic investigative stories Eaton assigned as readings. The second story Frissell wrote examined questions of athlete behavior and academic performance that hover around the University of Montana Athletic Department. That story ran as a feature in the Montana Kaimin. Frissell said Eaton was an important resource throughout the reporting process, noting especially the professor’s accessibility. “I’d finish a bunch of interviews and I’d be really excited and could run straight up there and talk with him about it, and that was incredibly valuable,” Frissell said. The students said they’d run into reporting challenges they hadn’t seen elsewhere. “For the first time I was asking people to tell me things off the record, and getting other people to confirm it. That was all really new and something I totally believe I would’ve graduated from journalism school without ever having the opportunity to do,” Frissell said. For Bubnash, that challenge came when she left a message with one of the property management companies she was investigating for her story. Their attorney called her back. She’d never run into anything like that, and considered dropping the story. “I asked Joe (Eaton) what to do, and he said no definitely interview them still,” Bubnash said. She did, and ended up very pleased with her story, which included the fact that a management company had refused to comment to a reporter, and instead had her speak with an attorney. On December 8th, graduate student Katie Riordan was recognized for her promise as an international correspondent when she received the Overseas Press Club Foundation Scholar Award. The recognition was accompanied by the chance to spend her summer break doing international reporting, through a fellowship at a foreign bureau. 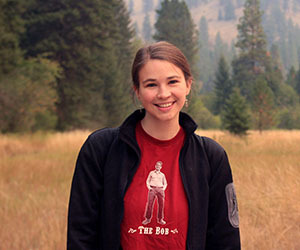 Katie Riordan is a graduate student at the University of Montana School of Journalism. Photo by Katy Spence. Bureaus run by the Associated Press, Reuters, Forbes, the Wall Street Journal or the Global Post are all possibilities for Riordan. Wherever she ends up, it won’t be her first time filing stories from foreign soil. Riordan completed her undergraduate studies at the University of Colorado Boulder, where she majored in broadcast journalism. Post graduation, she did a few stints at community newspapers in New York City. In 2012, she left the United States to take a job as an editor at an English language paper in Yemen, which borders Saudi Arabia. Riordan had traveled and lived abroad before, but says the move wasn’t a calculated decision. Her reasons for moving to Yemen reveal a deep wanderlust and interest in other cultures. “You can read all about it but being there, living there and reporting there is the experience,” Riordan said. After more than a year at the English language newspaper, Riordan left and began freelancing. Over the course of six months she wrote stories on women’s rights, refugees and migrants and a variety of human interest stories. Her work was published in the Christian Science Monitor, Al Jazeera, the Economist and the Middle East Eye, an online news organization based out of England. Riordan continues to contribute to the Christian Science Monitor, with an article on Syrian refugees in Somaliland published just days before she received her award. Freelancing was a challenge at first, but being on the ground in countries of international interest helped her. “It’s hard to build relationships with editors, but once you do and can demonstrate that you can produce work from your location things start to snowball,” she said. Returning to the U.S., she came to the Environmental Science and Natural Resource Journalism Masters program to hone her reporting skills and develop a specialty in environmental reporting. While Riordan says she misses life abroad, she’s been enjoying her classes and has a story in the upcoming 2016 Montana Journalism Review about tensions between the Department of Defense and reporters in war zones. Next semester Riordan hopes to supplement her journalism and environmental science coursework with classes in Arabic, in order to build on her language base and improve her eligibility for reporting from the Middle East. But today, she’s excited at being recognized by the Overseas Press Club, and anticipates a productive summer abroad, wherever in the world it may take her. “It’s a really prestigious organization, and I’m looking forward to getting back overseas to do some reporting on the ground,” Riordan said. You can get an advanced read of Riordan’s upcoming story in the Montana Journalism Review here.